The pictures I promised are up, but I'm only putting one on the blog for now. 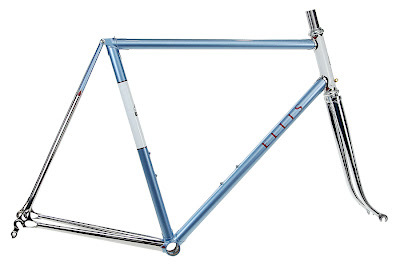 You'll have to go to the website and check out the new galleries with this frame and the 29er. It's been busy keeping up with e-mails and other stuff, so I'm keeping this post brief. I'll post some more photos in the next day or two of my single speed frame which was also a show bike. Finally, I have to give a big thanks to Drew at Ben's Cycle in Milwaukee. He's the man behind all the great studio shots of my frames. You may have noticed that my photos are usually from a funky basement and his look a tiny bit more professional. It's no accident and he deserves a lot of credit for making me look extra good! Check out Ben's Cycle here; http://www.benscycle.com/. Lots of cool stuff.